I won't be the first to say this and I won't be the last... I am so over the dickheads in politics in this country. I was never the biggest fan of KRudd but didn't think he was bad enough to be rolled the way he was. 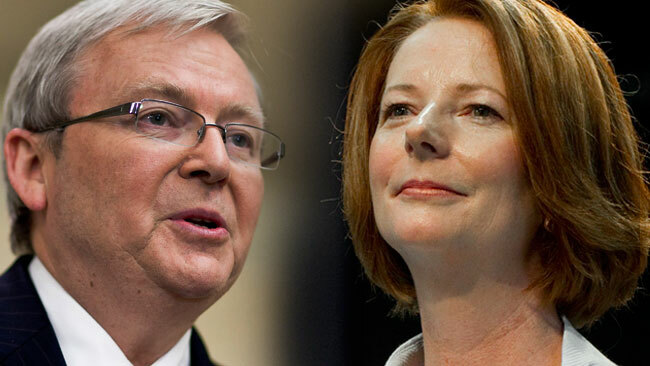 I've never liked Gillard, before June 2010 it was for purely shallow reasons, mostly her annoying voice! But after June 2010 I wasn't impressed with everything that happened and how KRudd was ousted and thought that it was a pretty big blow for the advancement of women. Many (most?) would disagree with me on that, but considering that most women usually have to work harder and better to have the same respect that men get, being handed the PM's job the way she was just was not a good look. Tony Abbott? I'd probably class myself as a swing voter, with a Liberal lean, but I really don't like Abbott. I would vote for Turnball in a heartbeat. He comes across as a man who stands up for what he believes in and doesn't just bend to popular opinion. Back in December 2009 I wrote an open letter to the NSW Labor party and I could just about re-publish it today but change the references to federal Labor. I feel the same way.